The Viet Nam Textile and Apparel Association (Vitas) said that in December 2018 and January 2019, Viet Nam's yarn production industry had to accept a drop in yarn price to $2.6 per kilo, as well as a kilo of cotton falling to $2.1, to maintain production and keep customers. Normally, in yarn production and trading, when the gap between raw material buying prices and product selling price is $1 per kilo, yarn producers can maintain operations. However, from October 2018 until January 2019, the gap was only 50-60 US cents per kilo. Therefore, the yarn manufacturers had to suffer huge losses from their yarn production, said Le Tien Truong, Vitas deputy chairman. In February 2019, the gap was nearly $1 per kilo with the cotton price at $1.9 per kilo and yarn price at $2.8 per kilo. This level was acceptable for the yarn production industry. However, the gap is unlikely to be sustainable due to the results of the US-China trade negotiations, according to the association. The difficulties faced by the domestic yarn production industry are partly due to the US-China trade war, because 25 per cent of Chinese goods facing taxes when exported to the US include yarn. For many years, Viet Nam’s yarn products have been mainly exported to two major markets – China and Turkey. 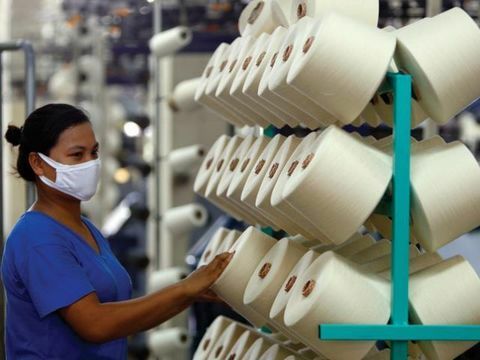 However, Turkey has applied anti-dumping measures on Vietnamese yarn so 70 per cent of Vietnamese yarn products are exported to China, the largest fabric producer in the world, according to the Viet Nam Cotton and Spinning Association. Therefore, China’s reduction of yarn imports due to difficulties in exporting textile and garment products to the US has affected Viet Nam’s yarn production. Cao Huu Hieu, executive director of Viet Nam Textile and Garment Group (Vinatex), was quoted by the Investment Review as saying that domestic yarn production faced difficulties from the end of 2018. In the last quarter of 2018, local producers saw yarn export orders fall and were forced to reduce the export price of yarn. Local enterprises expected the yarn market to gradually warm up from the second half of this year, Hieu said. Truong said enterprises needed to manage risks to maintain production while waiting for the market to recover.